Four warrior Clans have shared the land around the lake as equals for many moons. But a prophecy foretells that three ThunderClan cats will hold the power of the stars in their paws. Jayfeather and Lionblaze know that they are two of the cats in the prophecy. Now the brothers must wait for a sign from StarClan to discover the identity of the third cat. Meanwhile, Dovekit and Ivykitkin of the great leader Firestar are poised to become ThunderClan apprentices. Soon one sister will have an ominous dream - and will begin to realize that she possesses mystical skills unmatched by any other cat. In the midst of a cruel season that threatens the lives of all four warrior Clans, bonds will be forged, promises made, and three young cats will start to unravel the secrets that bind them together. Kathleen McInerney can be a tom, a she-cat, and a playful kit and more perfectly. She is the best warriors narrator out of all. Far better than Nanette Savard. The narrator was amazing, and had different voices for each cat. It fits with the feelings of characters, and the drama. I love the this book series. I highly advise people who like adventure stories to read the story. This book got us through a long road trip. The kids loved it! A bit confusing at first, but the names of the cats start becoming clear in a short time. It was really good. I think many people would love it. It was great. It was good. GREAT book to go to sleep to. i didnt like the narrator much but the book is great! i never listened to a audio book before but it was cool! I love this audio book, nothing to dislike about it. Did not really grab me until near the end. Do take note that this is from Harper Children's Audio. The narrator lends a cartoonish aspect where even many of the older characters still sound like children--which can be hard to listen to at first. There were also so many names being thrown around, that initially it was hard to follow and to know which of the characters were of actual consequence to the plot. Otherwise the story line was okay, but I probably won't go out of my way to get more books in the series. 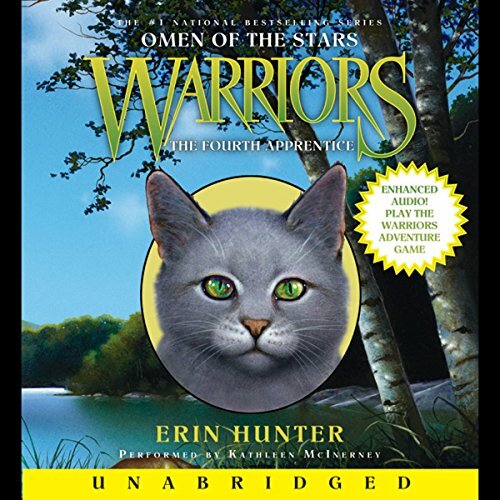 Would you try another book from Erin Hunter and/or Kathleen McInerney? Would you be willing to try another one of Kathleen McInerney’s performances? If you could play editor, what scene or scenes would you have cut from The Fourth Apprentice? 1 sur 29 personne(s) ont trouvé cet avis utile.